If you’re thinking about Mallorca, you’re probably thinking about all the binge-drink holidays of young people and all the negative stories that the media published last years. But the island has a lot more to offer than a wild nightlife. That’s why we’ve made a list with the 5 most beautiful places of Mallorca. So you will be able to discover the island yourself. Mallorca is the largest island in the Balearic Islands, these islands are a part of Spain and are located in the Mediterranean. There are living around 858.00 people in Mallorca and the island is a popular holiday destination for tourists. Although the residents made it clear, a few years ago, that they were sick of the tourists, the residents are still very hospitable people. We have made a list of the 5 most beautiful places of Mallorca to make clear that the island has more to offer than just a wild nightlife. The Bellver castle is a castle built in the gothic style on a hill, about 3 kilometers west of the center of Palma de Mallorca. 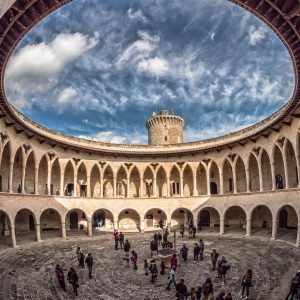 It used to serve as a residence of the kings of Mallorca and afterwards as a military prison. This is obviously a tourist attraction, but it is definitely worth visiting. Tickets cost € 4 each and can be purchased at the castle. The cathedral of Mallorca is also a must-see. You will be impressed if you see the cathedral from the outside, but the inside is just as impressive. 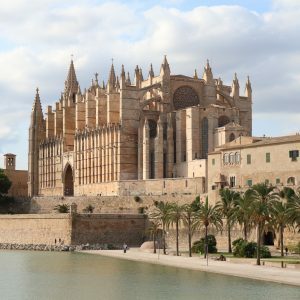 The cathedral is located in Palma and is 121 meters long! 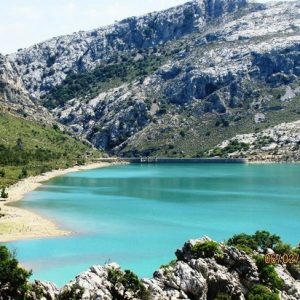 Lake Cúber is a lake that is artificially constructed and located at the valleys of Puig Major and Morro de Cúber. With this lake they provide water for the city of Palma de Mallorca and the surrounding areas. A beautiful view, as you can see below! One of the other most beautiful places of Mallorca is Valldemossa. Valldemossa is a small municipality and village on the island of Mallorca. The old buildings show a lot of the Spanish culture and the rich history of Mallorca. Moreover, there are regular events in Valldemossa and you can hike, cycle, go mountain climbing, golf and visit art exhibitions. 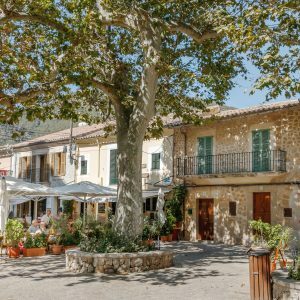 Port de Pollença is a small town in the north of Mallorca, and it’s known for its ‘pine walk’. This is one of the most popular hiking trails along various pine trees and you will have a fantastic view over the bay. It is recommended to walk the route during sunrise or sunset. After you’ve seen this you will understand why we think it belongs to the 5 most beautiful places of Mallorca. 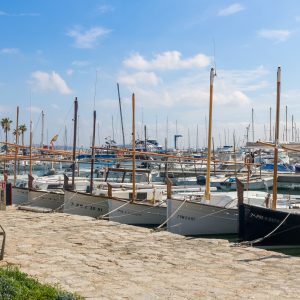 Next ArticleDiscover Spanish Spain to brighten your future!